Recently Matthew and I celebrated our 27th wedding anniversary. I was pleasantly surprised when he brought home this teak table for our deck. I had been looking in stores trying to find something that would compliment our teak chairs with no luck. Matthew designed and built this table using leftover wood from a recent project. There were very few boards of any size available yet there were a number of narrow strips/drops that made for a nice "breathing top", a top that sheds rain water. The legs turn 90 degrees at each corner to create a sense of movement. 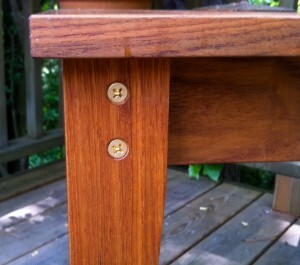 The brass screws join the legs to the aprons and add a little decorative interest. Epoxy was used to join the mitered top and reinforce the joinery. The table is finished with teak oil. 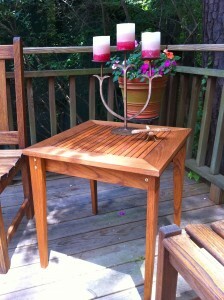 All in all it is a marvelous replacement for the old glass and white metal table that did not match our deck furniture.